The Life Center of Hernando Newsletter March 2016 is proud to report that this year started out with a whirlwind of activity. We want to tell you about the car and the banquet. We know everyone wants to hear about the new building and the new babies. We have new volunteers to introduce. First things first. We want to publicly thank God for His provision. He has positioned all of us for such a time as this to be able to help moms and infants at risk of homelessness. He provided 3 buildings in a 3 year span and all the finances to keep those buildings operational. He sent volunteers to mend the buildings and to mend lives. And He was right on time. building before the contract on the old building expired. We feared that if it all didn’t work out, we would have to put some residents back on the street. But it did work out and we even had 10 days to spare. It’s all good. The new building is exactly what we have been dreaming of these last 3 years. It is a large house sitting on 1.6 acres. 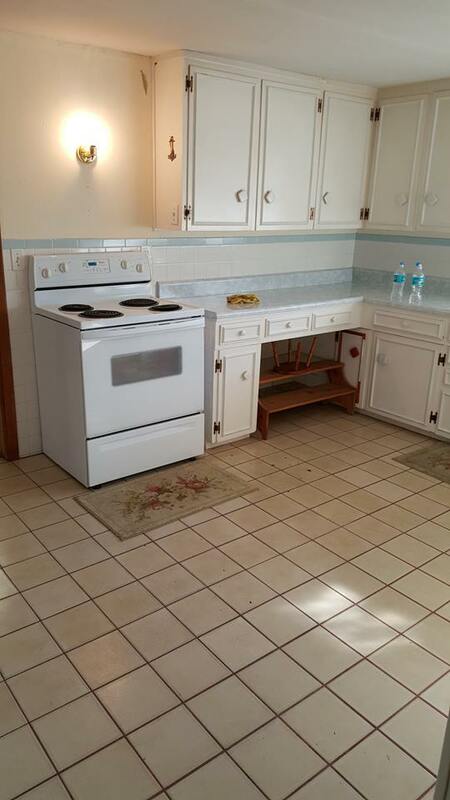 It has the potential for 5 bedrooms with some renovation. It has a pole barn, parking space and a wooded area. Various volunteers have been in and out all week cleaning and removing junk. One new bedroom will be located in the space that was the original kitchen before the new kitchen was added. That room has been gutted and now needs new flooring and several other things including a closet and a door. A volunteer project. 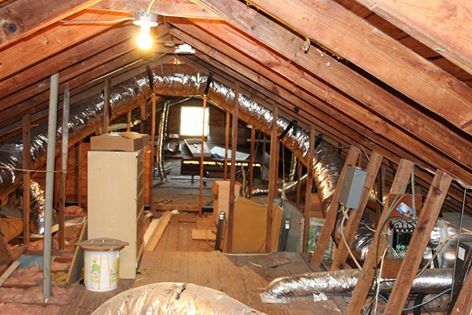 TLC acquired an attic when we bought our new place. We don’t have the time, energy or finances to do much with it right now. We have a couple of people with good imaginations thinking about the future use of this space. Anyone looking for a project? Located on our new property is a second, smaller building we think would make a terrific thrift store. It is currently full of professional art supplies, still in their original boxes. We hope to sell these at a deep discount. We are going to need lots of help to turn that building into a store so we can start to generate an income of our own! It will also provide our moms with retail experience. Our next event will be the Chamber Ribbon Cutting. We are aiming for early April. We are thinking about making this a combined ribbon cutting and art supply sale. Our first priority in that building is getting a ramp so we can invite Chamber members and artists to tour our entire facility and maybe purchase art supplies. The door is about 3′ off the ground so a long ramp is needed. There are no steps there. The interior floor is also raised. Dave Shepard was keynote speaker. Kit Raymond offered to match funds raised at banquet. Angela Welsh got food donated by local restaurants. 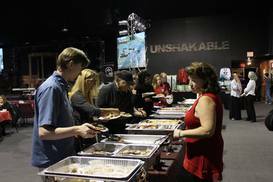 GWOC provided the room and tables. Thanks to everyone who contributed in any way. baby had a rough start, but now all is well. Soon after that, another TLC resident in very advanced pregnancy had go to her doctor appointment in Spring Hill. As a precautionary measure, she was then sent to the hospital for baby monitoring. Because TLC was able to offer her transportation, she did not have to ride the bus. This mom, who was only a few days away from giving birth, was very grateful. We are very grateful for the van! Not too surprising, soon after she too delivered a beautiful baby girl. Both moms and their daughters are all doing well. TLC has the cutest babies on the block! We love being a part of the miracle each time one of these precious tiny ones comes into the world. 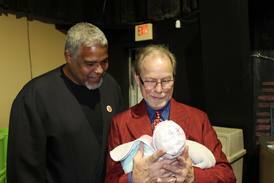 We are going to respect their privacy by withholding additional details, but there is one picture we will share of one of the babies being admired by Rolando Welsh and Robin Cook. Their faces reflect the love and support every mom and baby at TLC receives. Thank you for making it all possible. We have had so many new volunteers lately, we had to hold our first ever volunteer orientation meeting. It was an opportunity for new volunteers to meet each other, meet some residents and staff, see our shelter, have their pictures taken, complete the required paperwork, and pick their area of interest. We welcomed Jenna, Lindsey, Laura and Kim. Later we welcomed Rosemary and Debbie. There is still room for more. TLC has shown itself to be a success. Come join our team and watch lives transformed!